The delivery of surface-generated meltwater to the subglacial (basal) environment beneath glaciers and ice sheets is a driver of increased ice flow through raising water pressure in subglacial hydrological systems and lubricating the interface between the base of the ice and the rock or sediment beneath. 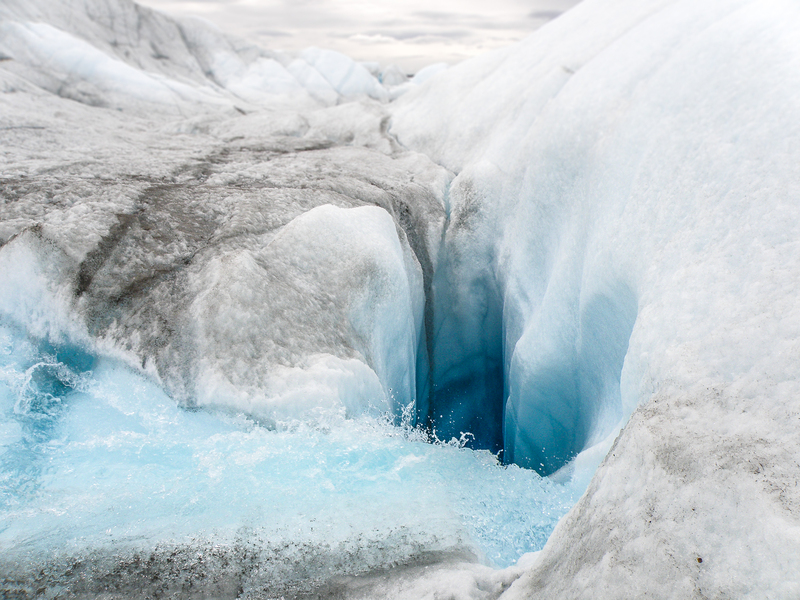 The extent to which this surface-to-bed meltwater transfer influences the average annual ice velocities of outlet glaciers on the Greenland ice sheet is debated, but we know that at least in the short term, the delivery of meltwater into the subglacial system promotes localised acceleration of ice flow (e.g. Bartholomew et al., 2011a: Hoffman et al., 2011). Our new paper in The Cryosphere describes the application of a model for predicting the formation of moulins (figure 1) and the drainage of supraglacial lakes (surface meltwater ponds) to the bed of the Leverett Glacier catchment in southwest Greenland. Figure 2. a) Daily average air temperatures at 457 m a.s.l. for 2009 and 2010, and moulin formation and lake drainage through the b) 2009 and c) 2010 melt seasons with elevation. Blue diamonds in panel b) represent observed drainage of lakes in events between two MODIS images, and red diamonds represent lakes which drained over a period of several MODIS images; after figure 2a of Bartholomew et al. (2011a). The model can be split into three main components: the generation of meltwater at the surface through melting of snow and ice; the routing of meltwater across the ice surface and storage in supraglacial lakes; and the propagation of fractures through the ice driven by water pressure from meltwater inflow. The outputs of modelling provide information on the timing and location of moulins penetrating from the surface to the bed of the ice, the timing and location of the drainage of lakes through hydrofracture, the storage of meltwater in the supraglacial and englacial (internal) hydrological systems, and the quantity of meltwater reaching the glacier bed. 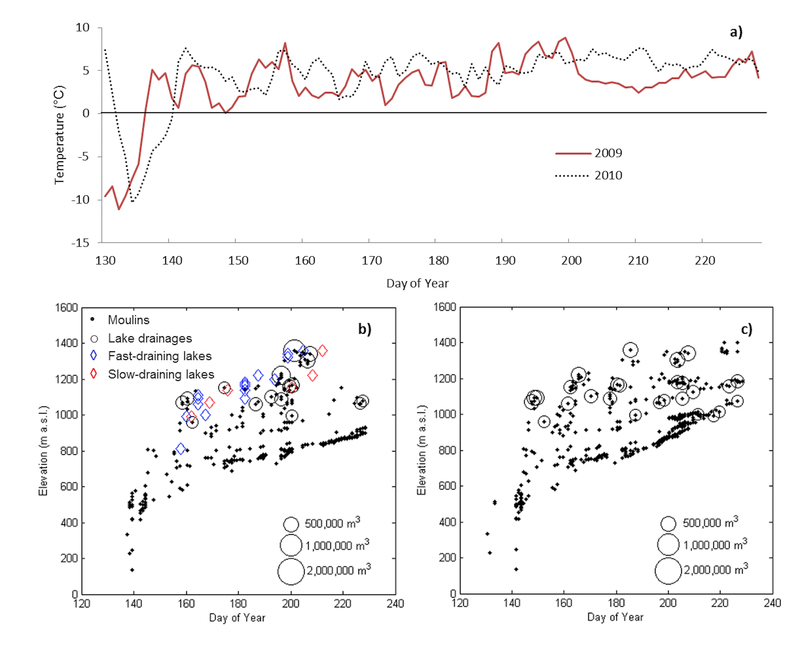 The results of our modelling were compared with ice surface velocities measured with a series of 6 GPS stations (Bartholomew et al., 2011a) and observations of supraglacial lake drainage events (Bartholomew et al., 2011b) in the Leverett glacier catchment. The pattern of modelled lake drainages compared favourably with that observed from satellite imagery during 2009 (figure 2) . Modelling for the 2010 melt season produced a 44% increase in the number of lakes which drained, with lake drainages starting earlier in the season and occurring more frequently at higher elevations in comparison to the cooler 2009 melt season. Formation of moulins in both years occurred at increasing elevation with time into the melt season, reflecting retreat of the snowline and water availability for driving fractures through thicker ice inland of the margin. Figure 3. 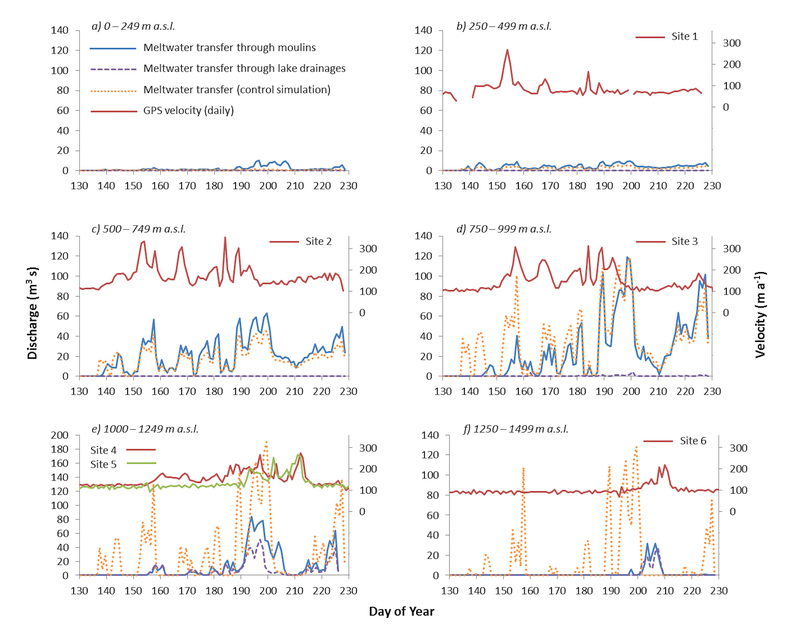 Supraglacial meltwater delivered to the bed each day through modelled lake drainages, moulins, and for the control simulation within ice surface elevation bands of 250 m during 2009. Ice surface velocities from GPS sites 1 – 6 are plotted within their respective elevation bands (after Bartholomew et al., 2011b). To demonstrate the need to account for supraglacial storage and routing of meltwater, and the ability of that water to reach the ice sheet bed through hydrofracture, we conducted a control simulation where all surface-generated meltwater was transferred locally and instantaneously to the bed. The importance of accounting for this was particularly apparent above 750 m a.s.l. (figure 3), where discharge modelled including supraglacial storage, routing and hydrofracture greatly outperformed the control simulation when compared against measured ice surface velocities. Modelled surface-to-bed meltwater transfer characterises well the up-glacier progression of increased ice surface velocities, with the relative contribution of meltwater drained through lakes increasing with elevation. Figure 4. Density of moulins and lake drainages predicted for the IPCC (2007) A1B mean June, July and August Arctic scenario for temperature change within 250 m ice surface elevation bands. With meltwater production rates responding to increases in air temperature, we tested our model with a future climate scenario (IPCC 2007, A1B June, July, August Arctic scenario) to investigate possible future changes in the occurrence of ice surface-to-bed meltwater transfer. The density of moulins and drained lakes at higher elevation in the Leverett catchment increased in response to this temperature forcing (figure 4), giving a 68 % increase in moulin numbers, 182 % increase in the drainage of supraglacial lakes, and, most importantly, a 14 % increase in the proportion of surface-generated meltwater reaching the glacier bed. At elevations above 750 m a.s.l. these increases result in more widespread delivery of meltwater to the bed through ice of large thickness, beginning earlier in the melt season. While below the ELA (equilibrium line altitude – the average elevation on a glacier where snow accumulation equals ice melt) ice dynamic response to meltwater inputs may be negligible over annual time scales (e.g. Sole et al., 2013), above the ELA we may expect a positive relationship between summer temperatures (and melt rates) and ice surface velocities where efficient subglacial drainage of meltwater is hindered by large ice thicknesses and shallow ic surface slopes (e.g. Meierbachtol et al., 2013). Crucially, the implications of a warming climate and increased ice surface melt for subglacial drainage configuration and ice dynamics are difficult to assess fully without incorporating a model such as this into models of subglacial drainage and ice flow. This work thus contributes to efforts to couple physically based models of surface meltwater generation, subglacial hydrology and ice sheet dynamics, as are required to better understand past, current and future sensitivity of ice sheet mass balance and dynamics to climate change.